Regular Tarot Bags - Timeless Beauty Regular Tarot Bag - Tarot Bags, Tarot Cards, Cloths, & More! What a wonderful fabric this is! It not only shows women from time periods spanning human history, but it also shows them in all stages of their lives--young, mid-life, and wizen. Naturally, this tarot bag would be ideal for any deck with a feminine slant. However, I think its appeal is much broader than that. As you can see, almost any tarot deck would coordinate because the drawings show women with various period hairstyles and costumes and they look much like the queens and princesses that appear on tarot cards. On the other hand, you'll find some modern women depicted also--women like you and me or our sisters and mothers and even the women we do readings for. The Tarot Art Nouveau, by artist Antonella Castelli, is ideally paired with this bag as you can see in the first picture. 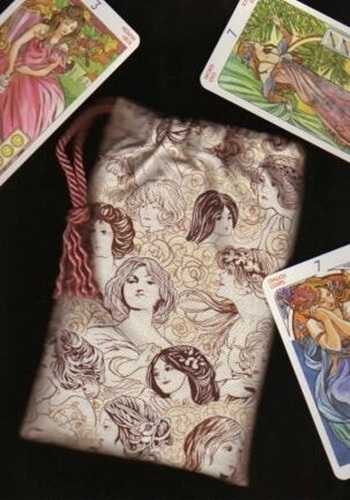 The bag also looks wonderful with the Victoria Regina Tarot. Hairstyles from both those time periods appear on the fabric. Additional good matches include the Madame Endora's Fortune Cards and the Parlour Sibyl. Size: Regular, fits tarot decks of 3.25 x 5.50 inches or less, as well as, oracle decks that are sometimes slightly larger, but have fewer cards. Cord colors: "Pink" to match the women's lips; "chocolate" to match hairstyles; "shell" to match the color of the roses between the women's faces; "natural" to match the background. Make your cord selection from the option box below. Note: The designer of this fabric has designated a large portion of the profit to go for Breast Cancer Research and that information is marked on the outermost edges of the fabric by the manufacturer. Consequently, when you purchase this bag and when we purchase the fabric to make the bag, we are both contributing to that cause. That makes us feel good. How about you?